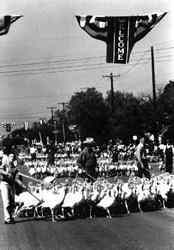 Turkey Trot Parade, Cuero Texas. ... 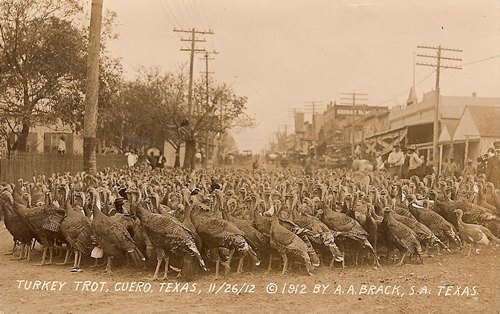 The first Cuero turkey drive to make the newspapers came in November 1910, when Rudolph and Oscar Egg of the small, German-rooted community of Meyersville drove 1,200-plus turkeys to the county seat for sale at the processing plant, which one newspaper indelicately referred to as a "slaughter house." It took the brothers and six hired hands on horseback two days to herd the birds 13 miles into town. Soon, Cuero had two processing plants and cold storage facilities. Given the area's mild climate, abundant open land and natural food sources, turkey raising in DeWitt County took off faster than a startled Tom. 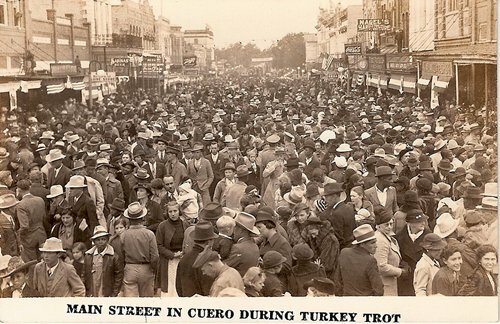 By 1914, Cuero shipped more turkeys than any other place in the nation. One turkey drive had 8,000 birds flapping and pecking their way along Main Street on their way to becoming holiday meals. But there would be larger herds. "It took the drovers 30 hours to deliver the turkeys," a North Texas newspaper said of the 8,000-bird drive. "The birds took a notion to roost in a grove about four miles from town, and nothing would induce them to continue the march to the slaughtering pens." On the other hand, the article continued, "When the birds are well behaved and meet with no strange obstacles on the road the drovers have no difficulty." Still, the unidentified journalist pronounced, "When a turkey drive becomes really frightened a cattle stampede is a tame affair in comparison." When traveling the roads of Texas and you're in that certain antique or junk store on the side of the road. If by chance you see an old pop bottle with embossed Turkey's on it GRAB IT! You're more than likley to have found a commemorative Cuero Turkey Trot bottle and a piece of Texas History! Cuero is famous for it's annual Turkey Trot Parade down main street and these bottles were made for the occasion. 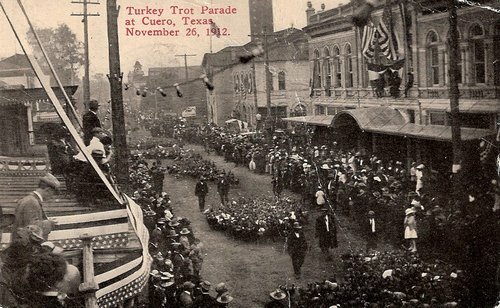 These parades have been taking place since 1912! There are 4 distinct types known to have been made, Three being embossed and one newer style with a colored label. 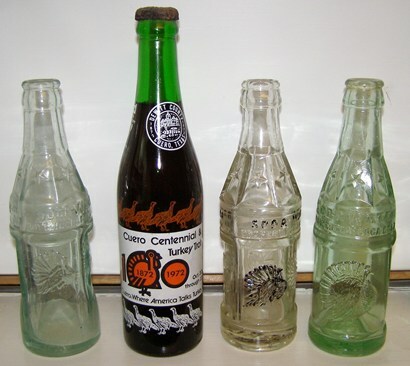 The most common embossed is a 4 sided green bottle with 4 Turkey's embossed(Pat'd 1923), then a round body bottle with one big Turkey embossed(Pat'd 1924), then the rarest of the embossed is a clear 4 sided with Turkey's with this bottle having the glass plant mark "3 RIVERS*" on the heel(mid-1920's). This was the mark of the Three Rivers Texas Glass plant(1922-37). The last bottle made was for the Cuero Centennial in 1972 and is what bottle collectors call an ACL bottle(applied color label). These can still be found in shops from time to time and some survived still full with the contents. These newer bottles held Cream Soda Pop.